As you undoubtedly know, I am passionate about authentic Italian food. I truly love the deep and age-old traditions, and tend not to mess with the classics. 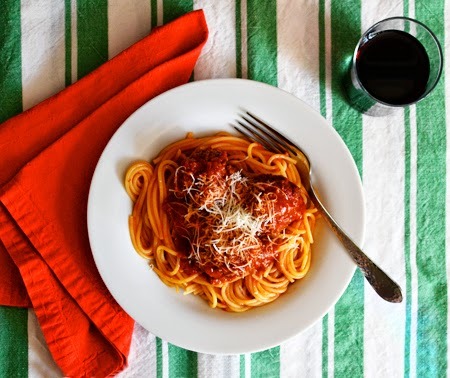 Italian-American cuisine is steeped in different traditions, giving rise to differences from the food we dine on when in Italy. 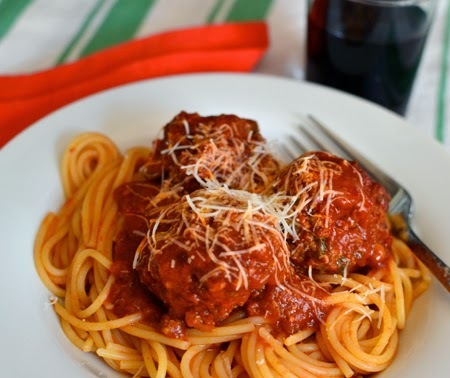 Growing up on the East Coast in the 1950s and 1960s, Italian food (to non-Italians) meant spaghetti and meatballs. In Italy, one never sees spaghetti with meatballs; there is spaghetti, which is a first course, or primo, and then there are meatballs - or polpette - which are a second course, or secondo. There is a wonderful scene at the beginning of the movie Big Night where Secondo, an immigrant right off the boat from Italy (played by Stanley Tucci), is trying to to explain to an American woman in his restaurant why there are no meatballs with her spaghetti. "Sometimes, the spaghetti just want to be alone." In my boyhood summers, while visiting Aunt Rae and Uncle Joe in Vermont, I would always look forward to spending time with Uncle Joe's Sicilian family - the large, loving, loud, cheek-pinching Tolaros. I remember walking down the driveway along the side of the house to enter Mrs. Tolaro's kitchen. In New England, if you are family, you enter through the kitchen - the heart of the house. There I would sit while Mrs. Tolaro and her daughters cooked a meal for the masses. I remember most her spaghetti and meatballs. I was very young, and my memories are vague, but I assume that all the men were in the living room discussing sports, smoking and having cocktails. I sat in the kitchen, had my cheeks pinched, and soaked in the savory aromas that wash over me with warmth and love to this day. This past week, the five year anniversary of Aunt Rae's passing, I was feeling the need to be connected to those memories - a craving for comfort. The kind of comfort only a family recipe can offer. My cousin, Michael Tolaro, visited us in Tucson several years ago and, while here, taught me how to make Mrs. Tolaro's spaghetti and meatballs. That was just what I needed to make this Sunday perfect. Panic set in. Nowhere could I find the recipe. It was Saturday at 6:30pm (9:30pm in Vermont, where Michael lives) and I hesitated to call him so late. But it was, after all, an emergency, right? Luckily, he was still awake and gladly shared the recipe with me. Sunday supper was saved. 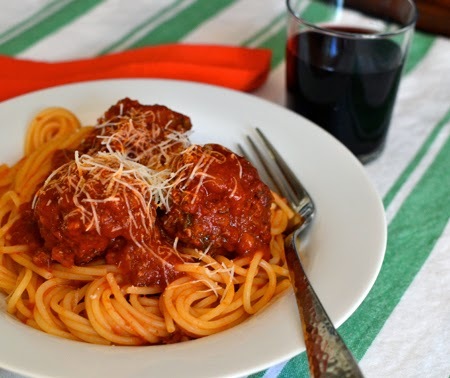 Who can say why one thing or another tastes like home, but these meatballs in red sauce on spaghetti are just that. And home is where my heart is this week. 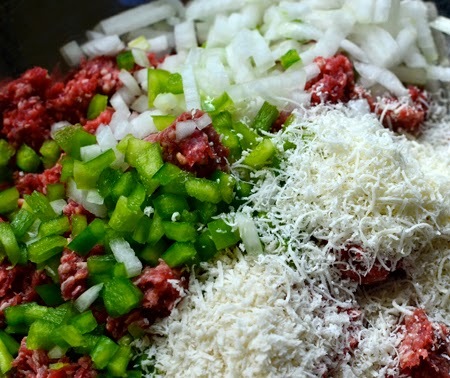 Mix the meat, onion, bell pepper, breadcrumbs, cheese, and egg in a large bowl; knead the mixture until all ingredients are evenly distributed. 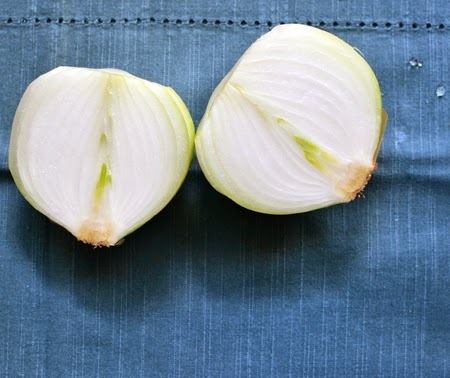 Don't worry if some of the onion or green pepper falls out - it will get used! 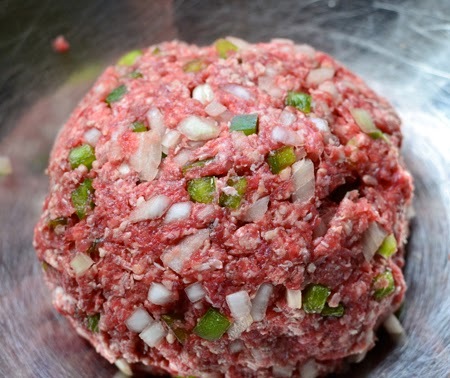 Divide the mixture into 10-12 meatballs, about 2 inches in diameter. Heat a large Dutch oven or heavy-bottomed soup pot on the stove. When very hot, add a little oil and tilt the pan to distribute the oil over the bottom. 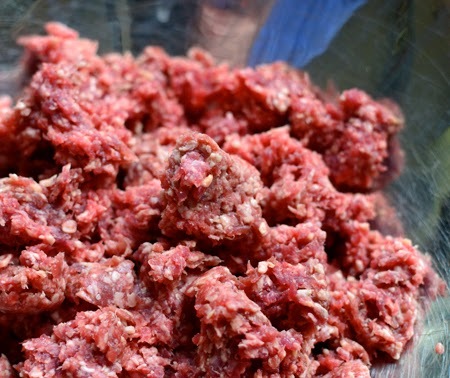 Fry the meatballs on all sides till nice and brown. 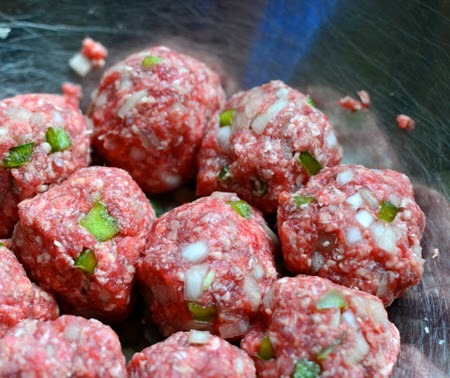 When you add the meatballs, add any onion or pepper that was in the bowl. 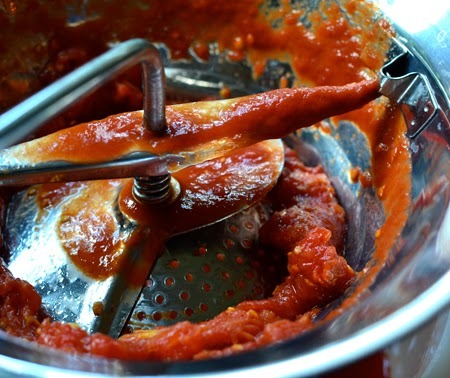 While the meatballs are browning, run the San Marzano tomatoes and all their juices through the medium disk of a food mill (or you could use two 28-ounce cans of crushed tomatoes - but Mrs. Tolaro used whole tomatoes and the food mill). When the meatballs are nicely browned, add the puréed tomatoes and the tomato paste to the pot covering the meatballs. Fill the tomato paste can with water and add it to the pot. Stir gently to combine, being careful not to break up the meatballs. 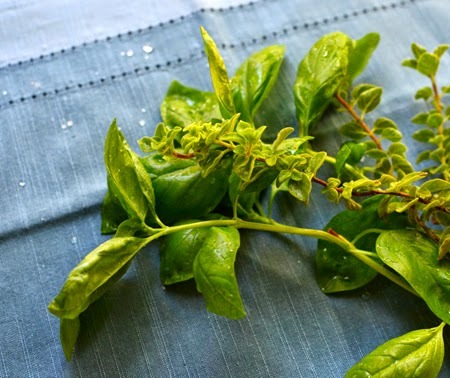 Add the fresh oregano and basil, season with salt and pepper, and let simmer on low heat for 1-2 hours, stirring from time to time. The longer the better. Cook the pasta in well-salted water (remember, pasta is one of the starches that gets its flavor from being cooking with the salt in the water). Drain the pasta and mix with a little of the red sauce. Divide among 6 pasta plates, and top with some more sauce and a couple of meatballs per serving. 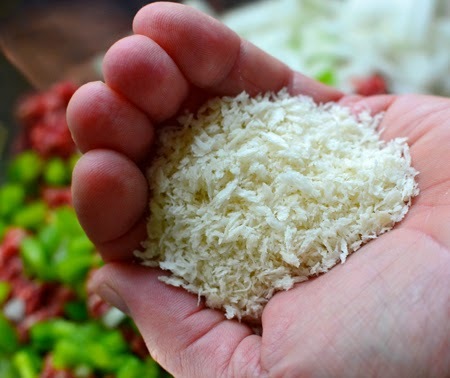 Sprinkle with cheese and serve. 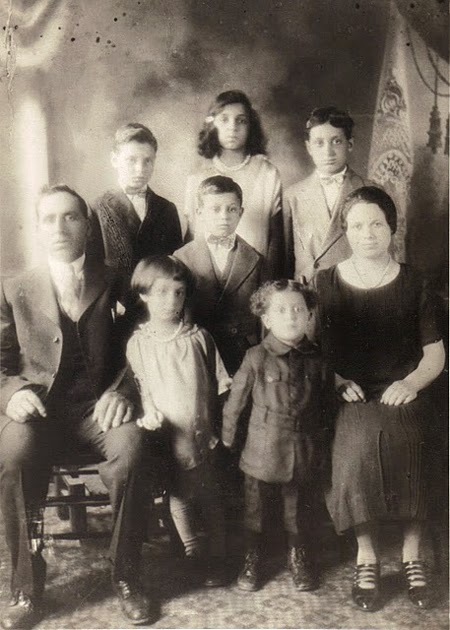 Maria (Mary) Tolaro with her husband and six children. This is a must make very soon. My husband loves spaghetti and meatballs. I remember many stories you have shared about your aunt. Thanks for sharing another one. I am glad these will make Dave happy. They certainly worked fro me! I absolutely adore meatballs. Yours sound absolutely divine. Thanks, Cory! What is it about them? They are so good! Mama mia, how I love meatballs! Wonderful story, David... and I adore that photo. Wow. I am so glad Michael Tolaro sent me that photo - I love having it. I LOVE this post! Your story underscores what a central role food plays in our relationships, whether around the table or in the kitchen (with our cheeks being pinched !). Thanks for sharing the story and the recipe! Sharing food around the table was such an important part of my upbringing, and probably explains who I am today better than anything. This looks so comforting! What a wonderful tribute to Mrs Tolaro. I had no idea that traditionally meatballs and spaghetti are served separately ! Have a wonderful weekend David! Have you seen Big Night, Ahu? If you have streaming, just watch through the scene where he goes crazy trying to explain why they don't serve spaghetti as a side to risotto. And then why, once she orders a side of spaghetti to go with her risotto, she gets no meatballs. Isn't it great how we can connect with our family and ancestors through the old recipes ? Sometime I'll have to tell you about my great grandma's Lebkuchen recipe and WWI and how it reached Iraq in 2008. You have your cellists mixed up! Roseycello is me, Cathy Hackert! OMG - I had no idea! All these times I thought RoseyCello was Susan! How funny! I still want to hear the story, though! I'm not a huge fan of meat sauce, I think it's the texture, so I always prefer meatballs. 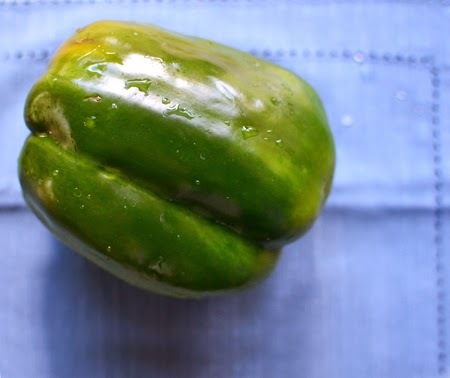 I love the green peppers in these, and will make very soon. Comfort food cures so many things, doesn't it? It does really cure a lot of our woes, doesn't it, Nazneen? I hope you like these if you try them. Hi David, thanks for sharing such wonderful memories, what a great tribute to your Aunt Rae, the meatballs look amazing! Thanks, Cheri. I miss her every day! As simple as this delicious recipe is, it probably wouldn't be a mid-week dinner as much as I'd like it to be. I'm definitely giving this recipe a go on an upcoming weekend when I can allow it to simmer gently. I love spaghetti and meatballs! You are right, John! This is not a quick, throw-it-together-at-the-last-minute sauce! But, at least it doesn't need a lot of attention! Lovely post, David! I immediately thought of comfort food at the first picture. This looks and sounds amazing. Thanks, Cathleen. I have been in such a comfort food mood lately! I love the kinds of recipes that bring back memories... where just one forkful can trigger such strong and specific feelings. True, spaghetti and meatballs is never seen here, but it is a part of my childhood on the East Coast too. Fiona - I am so glad you commented! I was hoping someone from Italy would corroborate my story of no spaghetti WITH meatballs! I don't think any of us from the East Coast can imagine a life without them together. What a lovely tribute - using Italian tomatoes makes all the difference! It is surprising how many American-Italian dishes can't be found in Italy. But some of them are just plain good! This dish looks great. I know, Susan - but as I just said to Greg, that is why I like knowing how things came to be. Our view of Italian food is very skewed in this country, and sometimes people go over and seem disappointed in the real stuff. It is much better for them to know that there are two very different cuisines at work. Don't you think? Loved your story…I can just picture you in that wonderful smelling kitchen. BTW, my recent comments seem to be disappearing but if this one goes through thanks for the decadent brownie recipe. Doubly thanks, Karen - sorry about the comment issues. I really have to wonder what is up with Blogger. Glad you like the decadent brownie recipe - boy, are they good. And I think you will like these meatballs and spaghetti, too. Valentina - don't you think that sometimes, food is the most amazing way to connect to family both past and present? What a sweet way to put it, Lily! Thanks so much for your comment and for stopping by Cocoa & Lavender! An absolutely wonderful post, David! I love those special family recipes that bring back such warm memories of years gone by. 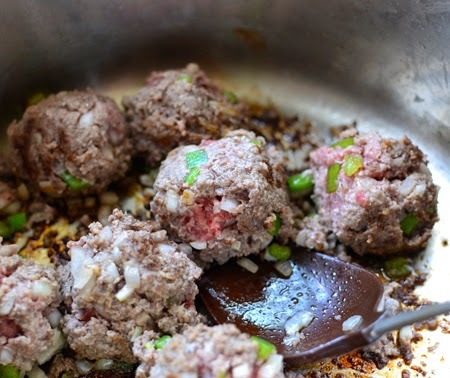 Your meatballs look marvelous…I have never mastered meatballs, and yet they happen to be my husbands favorite! I might have to give your family meatballs a try. While I was in Italy this summer our guide told us that Italians never serve meatballs with their spaghetti. I found that to be a strange fact! I wouldn't lie to you, Kathy - you will never see a meatball and spaghetti on the same plate in Italy unless you make it yourself! :) I hope you do try them and that Bill likes them! Meatballs are such a staple here, with so much italian immigration in the early 1900's. But we usually eat them with rice. No pasta, though the globalization of the last decade has changed that a bit. But not much. Such an amazing comfort food! I absolutely love meatballs in rich tomato sauce. Italian food IS comfort food for me! Meatballs on rice? We will have to try that! We vacillate between Italian and Indian for our comfort food!